CHRISTIANS in Syria are accusing al-Qaeda-backed Islamists of having carryied out one of the worst atrocities of the war so far, and killed more than 40 members of the minority Christian community during their occupation of the town of Sadad, north of Damascus. The Syrian government announced last week that its forces had regained control of this strategic town. 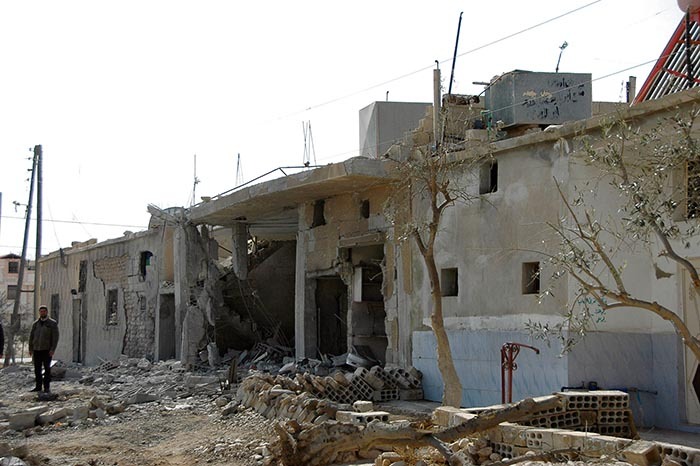 Aftermath: a man stands next to ruined homes in Sadad after government forces took control of it from rebel fighters. In a report by the news service of the Pontifical Mission Societies, Agenzia Fides, the Syriac Orthodox Metropolitan of Homs and Hama, Archbishop Selwanos Boutros Alnemeh, said: “Forty-five innocent civilians were martyred for no reason.” It was, he said, the “biggest massacre of Christians in Syria in the past two-and-a-half years”. It appealed “to all parties in Syria – the government as much as the opposition factions – to ensure that the longstanding conviviality between all believers and communities is not broken by actions that use Islam for unIslamic ends”. A meeting of Arab Christian representatives in Beirut last weekend also condemned the killings. One delegate said it was “imperative that we unite under one umbrella to agree on our stances and further join together to make decisions and pressure local governments and the international community”. The violence in Sadad represents just a fraction of that occurring daily in Syria. Early on Tuesday morning, a mortar round struck the Holy See’s nunciature in Damascus, causing damage to the roof, but not injuring anyone. There was no indication who had fired the round or if the nunciature had been targeted. The UN estimates that some 9.3 million people in Syria, or about 40 per cent of the total population of 23 million, now need outside assistance – up from 6.8 million in September. The Under-Secretary-General for Humanitarian Affairs at the UN, Baroness Amos, said that the crisis in Syria “continues to deteriorate rapidly and inexorably”. More than 100,000 people are thought to have died in the conflict, and 6.5 million have been internally displaced. Of the two million Syrians who have sought refuge overseas, more than 700,000 are in Lebanon. About 50,000 Christians from the Qalamoun district, north of Damascus, much of which was recently occupied and destroyed by Islamist rebels, are awaiting a reply from the Moscow authorities to a request to be granted Russian citizenship. A spokesman for President Putin said that the request was being considered. In their letter to the Russian authorities, the Christians described Russia as a “positive element for global peace and security”, and they accused the West of supporting the terrorists.